I created a quick gift tag using Simply Charmed for Santa and George and Basic Shapes for the tag. I stamped the background with snowflakes and glittered Santa. It's fun, simple and waiting for a gift. Such a cute tag! Love that Santa!! Thanks so much for joining us at The Sisterhood ‘HAND STAMPED BACKGROUND’ challenge and please come back again soon! Merry Christmas! Very cute tag.s..and I love your Santa. Thanks for sharing this with us at BBTB2. Great tag, as you say, simple but fun! Thank you for sharing it with all of us at Crafty Boots Challenges. Really cute tag, lovin the sparkle! Cute tag! Thanks so much for participating in our Really Reasonable Ribbon Challenge. What an adorable tag, Evelyn! Love that cute little Santa. Thank you for joining us at BBTB2 this week! Merry Christmas!! 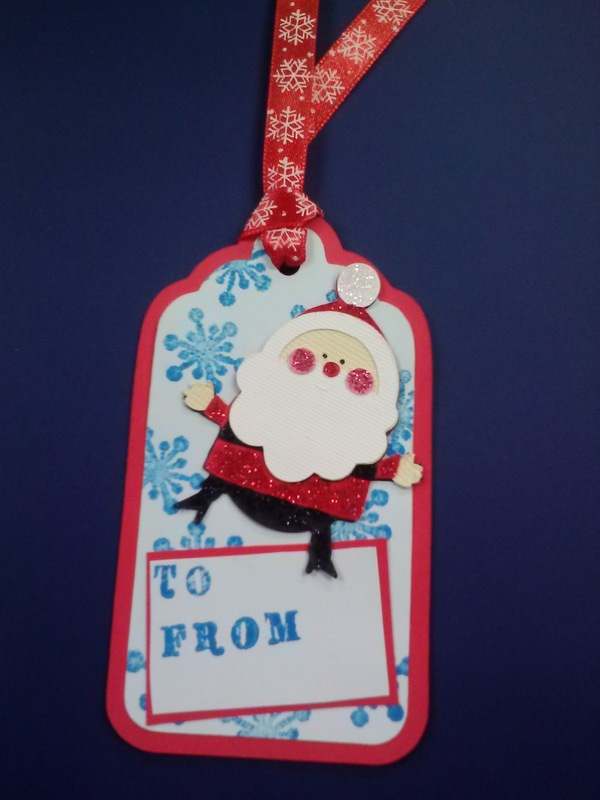 Super cute gift tag! Thanks so much for joining us at Celebrate The Occasion! super cute. Thanks for sharing with us at CTO. A totally adorable tag :) Thanks so much for playing along with our Hand Stamped Background at The Sisterhood of Crafters! What a fun fun tag. I love this Santa and Jolly Holidays. Thanks for creating with us at BBTB2 and Merry Christmas. Hi Evelyn - what a cute tag! 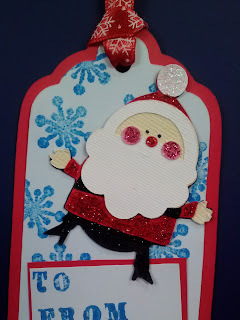 Love the glittery Santa and the snowflake background. Thanks for sharing your project at Lexi's Creations this time in our "Snow" challenge.